I’ve been learning English from Derek-sensei for about 4 years.English was my favorite subject as a student, so someday I wanted to learn English conversation. One day I met up with a man who was doing flyers in front of Tsukaguchi station. I was impressed by his dedicated manner. Sometimes I received his flyers and one day I decided to have a trial lesson. At that time he never spoke Japanese, so I worried about my lessons but I didn’t need to. He is good at teaching English in English. It really helped me to improve my English ability. Now I enjoy emails with him and recently I can write them offhand and more quickly. He does various kinds of lessons every time. I’m looking forward to my lessons every week. It’s great when I can understand what he says and I can answer immediately. Thanks to Derek-sensei, I love English! I have been interested in English since I was a student. I started to learn English conversation because I wanted to make more and more progress in my English. I have been enjoying every lesson since I started to go Smith’s School of English. I can learn English because my teacher teaches me English very intelligibly. I started to learn English conversation because I wanted to understand English television programs or English interviews on the news by myself. I was taught English at Smith’s by some teachers and they were all very nice. Derek-sensei is the best for me　because his lessons are easy to understand and I can learn English with relaxation and delight. The reason why I started to learn English conversation was because I was shocked and envied my senior coworker when he spoke English cheerfully with foreigners before my very eyes. At that time, I could say only “hello”, “please” and “thank you”. Derek-sensei’ s lessons are very nice. I’m sure you can enjoy learning English even if you are a beginner or your English level is very low because he always manages to teach using his gestures and eloquent face. I want to make progress in English as quickly as I can. I hope I can enjoy watching movies without subtitles and speak English comfortably with foreigners one day. My company has an education system which gives us a subsidy if we want to study English. Therefore I joined the system and started to learn English conversation.Derek-san makes me feel relaxed, so I can strike up a friendly English conversation with him.I hope my English ability is improving every day. I was poor at speaking English because I got nervous and I couldn’t get my points across to foreigners even though I didn’t dislike studying English. I started to learn English at Smith’s School of English when I enrolled in my high school. Thanks to Derek-sensei’s fun lessons, English conversation became very enjoyable for me. Nowadays I don’t feel nervous because the Smith’s system includes small-group instruction. I am also going to study hard with delight at Smith’s School of English from now on so I hope I can speak English in a foreign country one day. 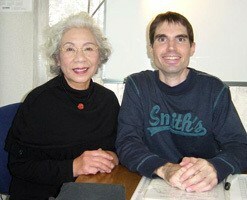 I started to learn English conversation at Smith’s School of English to take a trip to NZ with an Australian. She doesn’t speak Japanese, so I had to communicate with her in English. At first I was going to go to English school for only about three months till the trip. However after taking more lessons, communicating in English had become enjoyable for me, so I decided to continue going to Smith’s School of English. Derek waits patiently, even if it takes more time for me to speak English. He explains the meaning of a word, phrase or sentence in plain words. In the future I’d like to understand the English spoken by a local tour conductor when I take a trip. English is “the key” for me, the key to open the brand new door. I want to make more friends, and meet more people and communicate with them in English. I want to express my feelings more than ever. I think it’s not easy, but I will try to. Now, I’m not afraid to make mistakes, and don’t hesitate to speak English in this school. Thank you, Derek. Every time, you help me to find “the key”. I’ve been learning English at Smith’s School of English Tsukaguchi School since the end of last year. My main purpose for learning English is to boost my listening comprehension because I want to stay overseas for a long time one day. The teacher is honest and gentle! His lessons are very fun! Thank you very much for enjoyable lessons. I have been studying English for 3 years. I speak in broken English even now, but I am happy. I can’t speak English enough, but I can understand it.